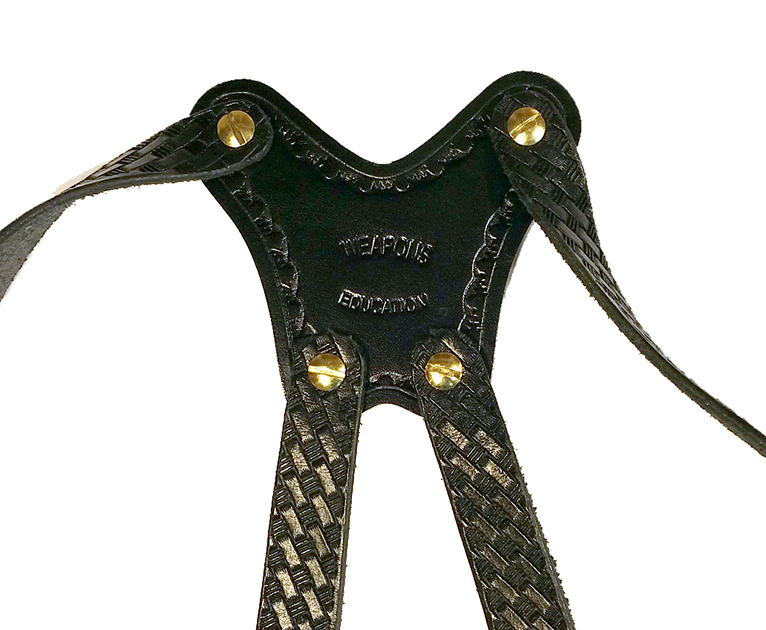 TOM'S "VERTICAL CLASSIC" - CUSTOM HAND-MADE DOUBLE THICK REINFORCED LEATHER SEMI-AUTO SHOULDER RIG. 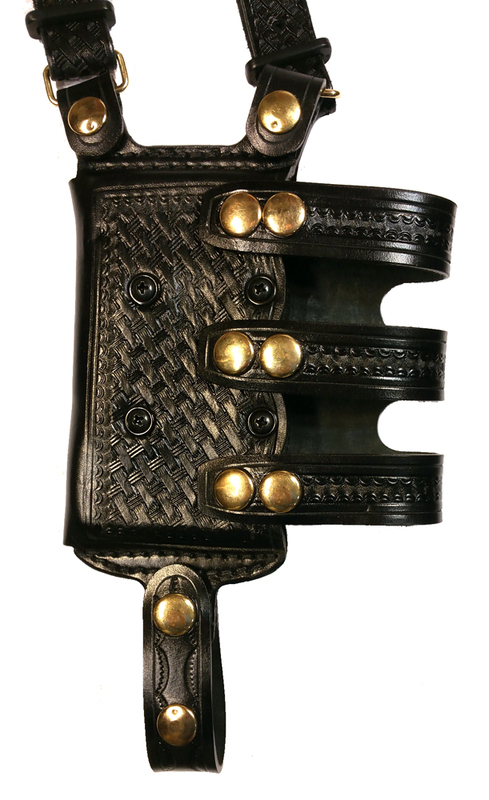 OPEN TOP VERTICAL HOLSTER, MUZZLE COVERED WITH LEATHER. 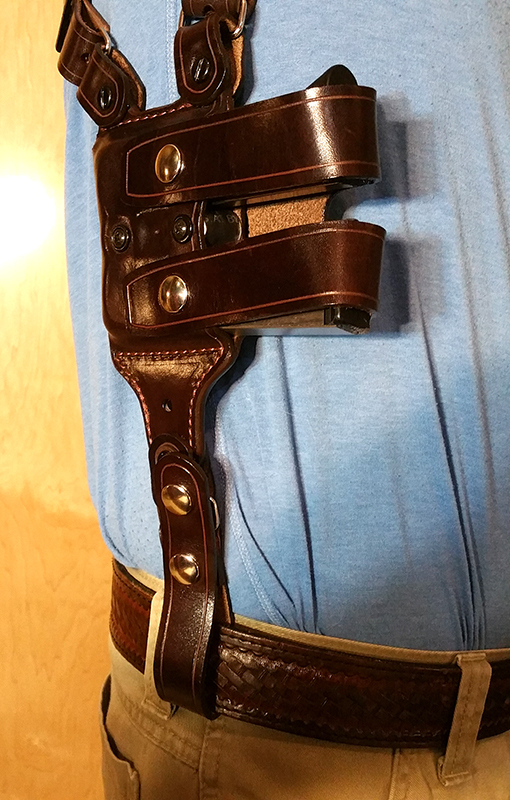 BACK OF HOLSTER ATTACHES TO GUN BELT. INCLUDES 2 VERTICAL MAG POUCHES ON OPPOSITE SIDE. CLICK HERE. Home > HOLSTERS CUSTOM (CLICK HERE) > Weapons Education custom leather holsters, for any gun manufactured! 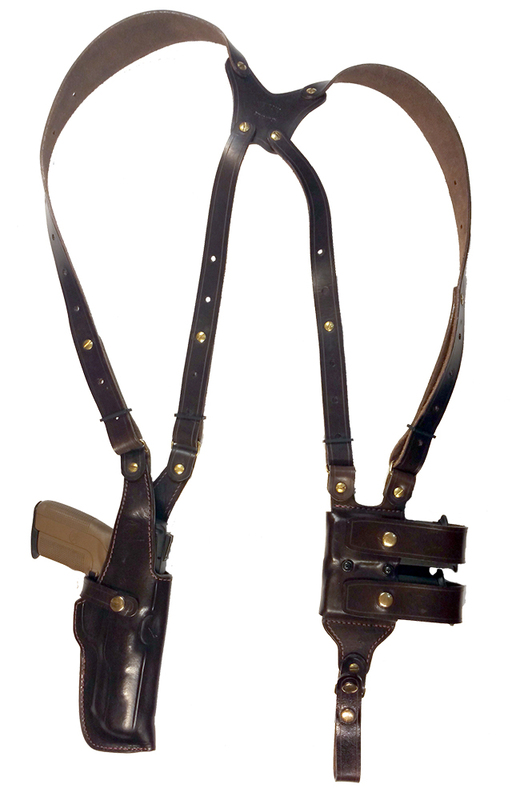 (Click Above) > Shoulder Holsters - Superior Highest Quality - Handmade Premium Grade A Leather - Proudly Made In The USA (Rare, No One Does This Besides Us). 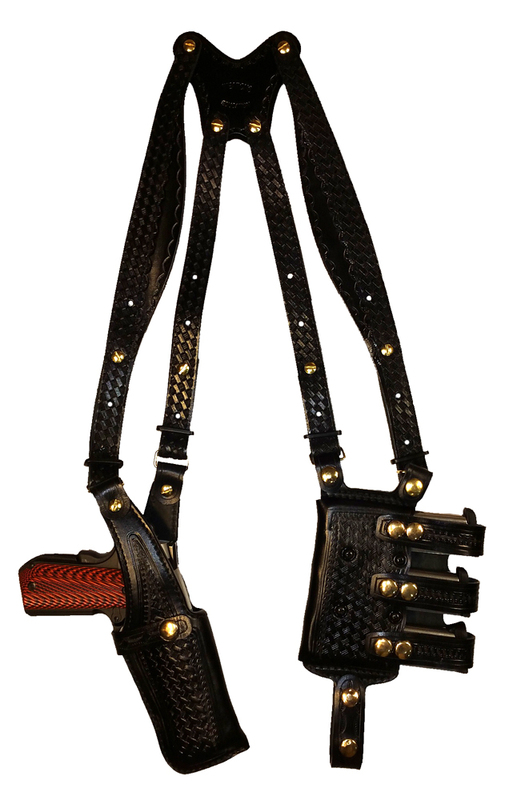 > TOM'S "VERTICAL CLASSIC" - CUSTOM HAND-MADE DOUBLE THICK REINFORCED LEATHER SEMI-AUTO SHOULDER RIG. 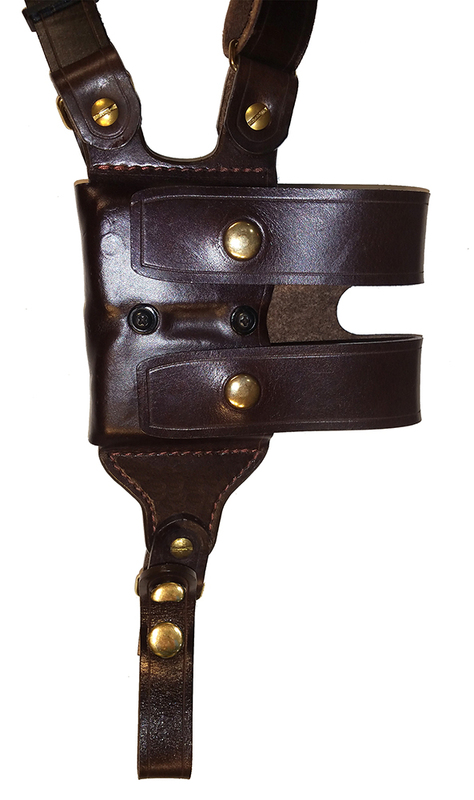 OPEN TOP VERTICAL HOLSTER, MUZZLE COVERED WITH LEATHER. BACK OF HOLSTER ATTACHES TO GUN BELT. INCLUDES 2 VERTICAL MAG POUCHES ON OPPOSITE SIDE. CLICK HERE. SHOWN WITH CUSTOM HORIZONTAL MAGS AND BRASS HARDWARE. 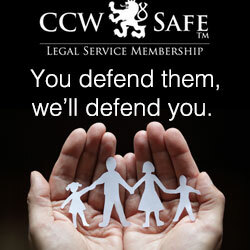 CALL 954-804-4381. Rear Lower Back Strap / Extra Support. This is a massive, double ply leather strap. 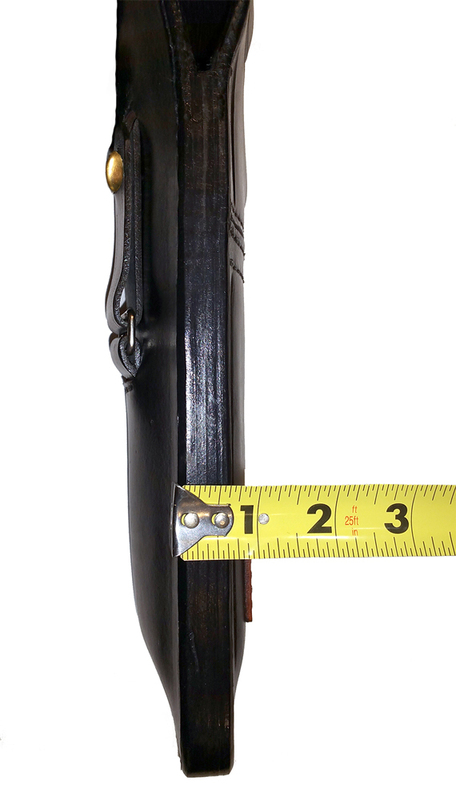 The leather is 1.75″ wide. 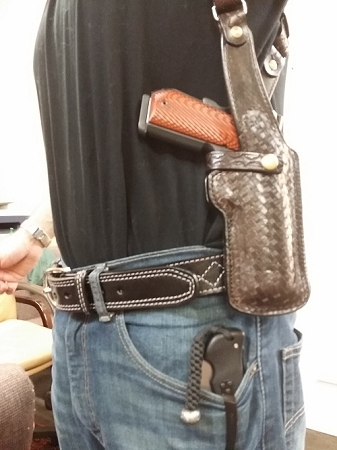 It attaches from your custom holster, across your rear lower back to your custom magazine pouch. Not Sure of your size? Place your order do your best and we'll call you. Customized - Call 954-804-4381 for exotic leather quotes. Custom Name On Additional Leather Stitched Patch. Your Desired Location - Call 954-804-4381 to discuss this custom upgrade. Interchangeable Holster - Select Below Yes Or No - If yes, indicate make, model, caliber and barrel length in Customization Notes below. We will call you to clarify your custom rig. Interchangeable Mag Pouch - Select Below Yes Or No - If yes put notes In Customization Notes below. Do your best we will call you to clarify. FREE - Smooth Leather Lined (Same Glossy Exterior Finish within the Holster) Gun will not touch rough leather. Complimentary per Tom. Customization Notes (Add Links If Necessary) You Will Get A Call and It Will Be Perfect No Matter What. 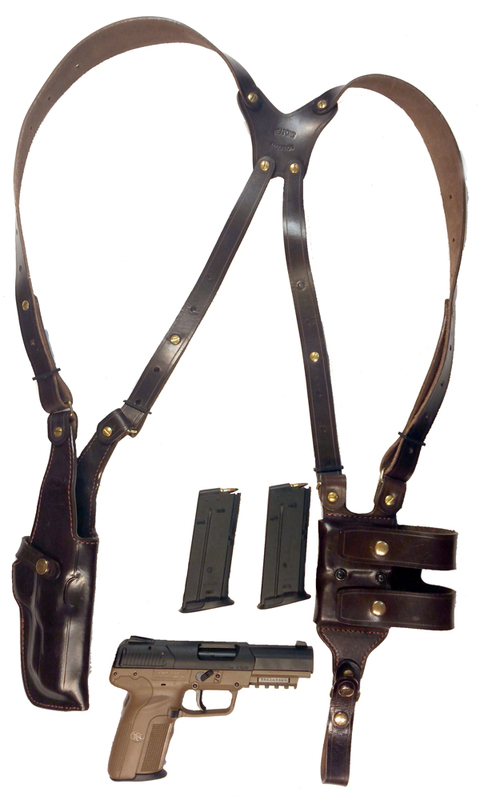 Call Armory Express Outlet 24-7 to build your own custom shoulder holster system. 954-804-4381. 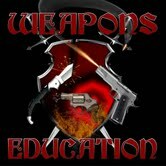 Tom, the owner of Armory Express Outlet, plus the host of Weapons Education.com has designed this holster with civilians in mind. It is extremely comfortable and razor blade hand cut similar to the way it was done in the 19th Century. 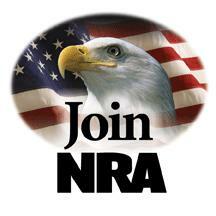 This holster is designed for hunters, civilians, law enforcement and all branches of our military armed forces. Provides all day comfort due to the extra wide ergonomic hand crafted harness. A perfect fast and smooth draw. It is constructed of the highest cost / premium steer hide (Tom's personal design). Molded hand crafted extra wide durable leather harness straps. 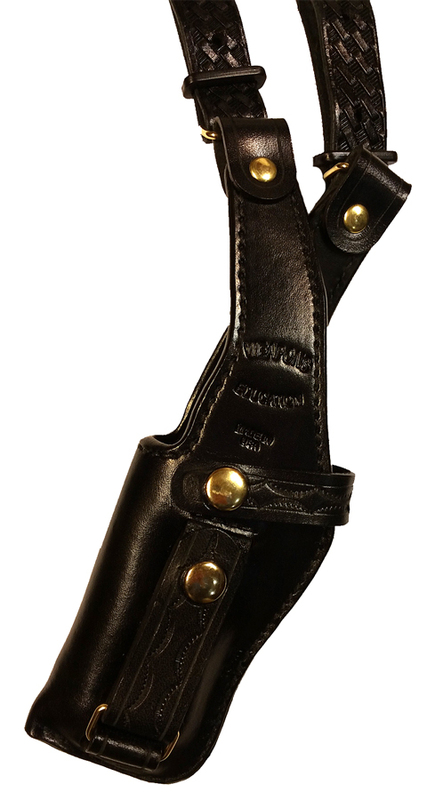 Double ply leather within holster construction, makes your custom holster the best handmade holster in the USA. Here is the facts: 1. Tom works out the details with you perfectly on the phone. 2. The quality of the leather is extremely rare, the thickness reduces the feeling of the weight of the gun and the magazines. 3. I recommend getting the horizontal magazine pouches so it points towards your belly button for easy access. 4. It came fitted and I adjusted it slightly. Per Tom's instruction I used blue Loctite on all of the threading. 5) Keep in mind there are enough holes on the straps that adds an immense amount of modularity. 6) The difference from this and the Bikini Shoulder Holster is that the muzzle is covered with thick leather. 7) I called Tom at 954-804-4381. He walked me through the selection process and it was a smooth experience. 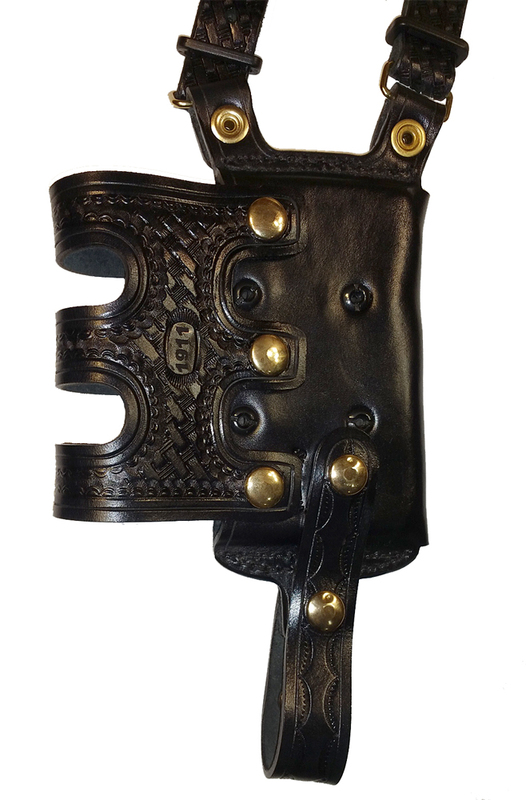 This holster should be priced at $350 in my opinion, giving his audience an amazing quality products and I see his custom holster company being the benchmark of all holsters in the world. 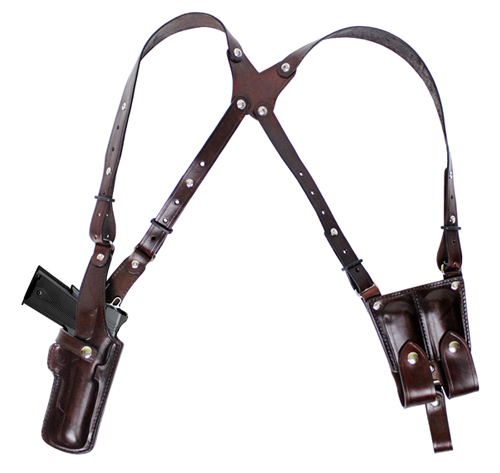 I recently received the Vertical Classic shoulder holster, which I ordered just a few months ago. I have used a lot of holsters, and have made many of them myself, with leather for a variety of pistols as well as rifle cases. 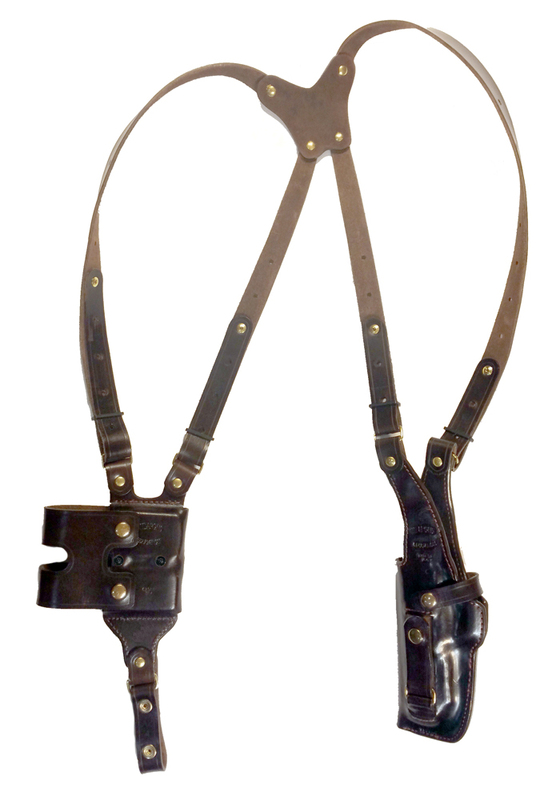 My last shoulder holster I have used since 1985. 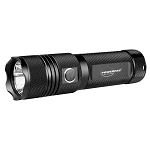 The new Vertical Classic is very well made, and has been worth the wait. Even though I could have made one myself, I decided to order this one, and I am not disappointed. 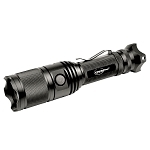 Very god quality work, and very good materials, just as promised. 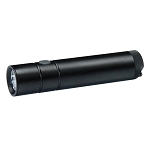 It is very comfortable and solid, fits my pistol just right, as promised. No regrets, and I would recommend it to others. The quality of my holster is absolutely gorgeous. I would have paid $700 for this rig. Highly recommended. I just got my shoulder hoister for my glock and it's top quality leather and great craftsmanship !! I would recommend this hoister to anyone and Tom was very helpful getting all my information for a custom fit! 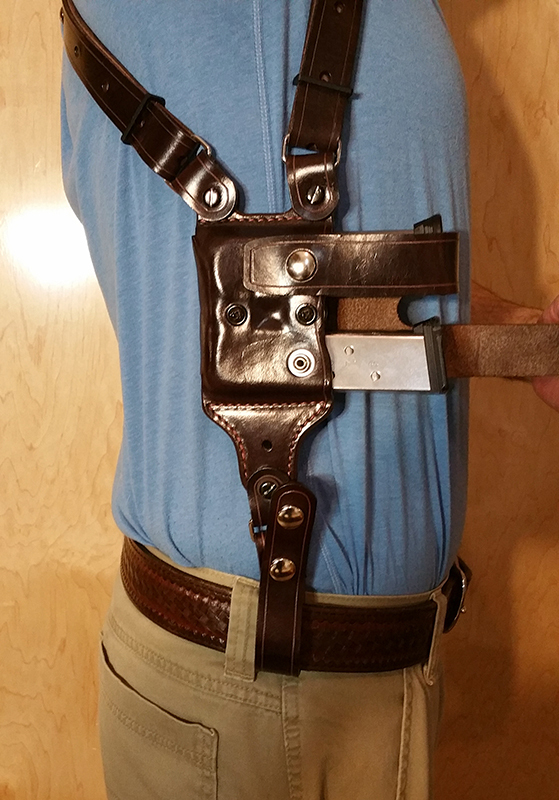 TOM'S VERTICAL REVOLVER "THE OPERATOR" - CUSTOM HAND-MADE DOUBLE THICK REINFORCED LEATHER REVOLVER SHOULDER HOLSTER RIG - HOLSTER AND AMMO ATTACHES TO BELT. VERTICAL - SPEED LOADER POUCHES - OPTIONAL. CLICK HERE. 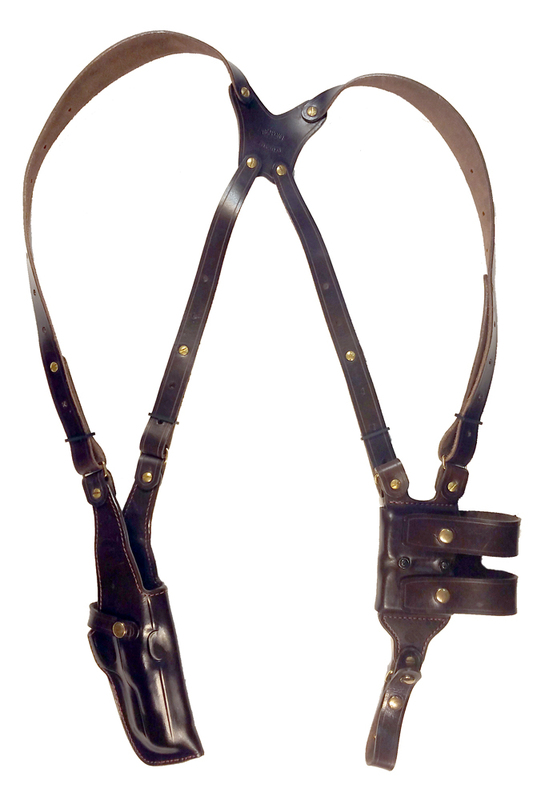 TOM'S "ANGLED STEEL LEATHER ENFORCER" - CUSTOM HAND-MADE DOUBLE THICK REINFORCED LEATHER OPEN TOP ANGLED SHOULDER HOLSTER RIG. STEEL REINFORCED. 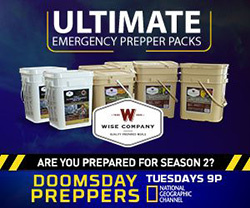 INCLUDES 2 VERTICAL MAGAZINE POUCHES, ATTACHES TO YOUR BELT. CLICK HERE. 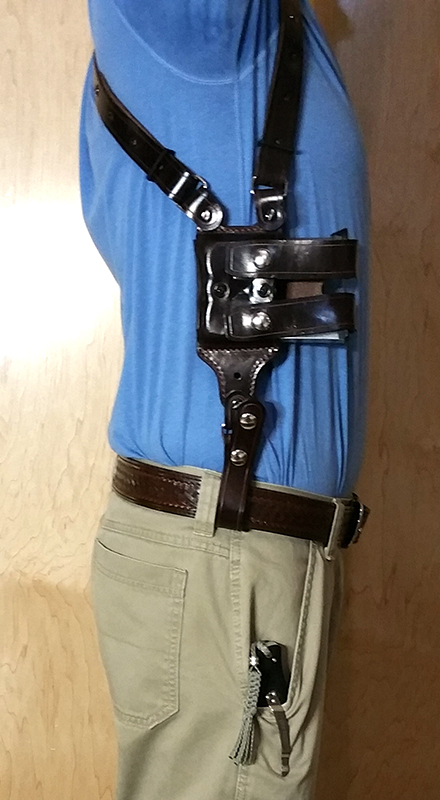 TOM'S "DISCRETE SHOULDER RIG" - VERTICAL - CUSTOM HAND-MADE DOUBLE THICK REINFORCED LEATHER VERTICAL SINGLE SHOULDER HOLSTER RIG (REVOLVER OR SEMI-AUTO). CLICK HERE. Copyright Armory Express Outlet. All Rights Reserved. eCommerce Software by 3dcart.